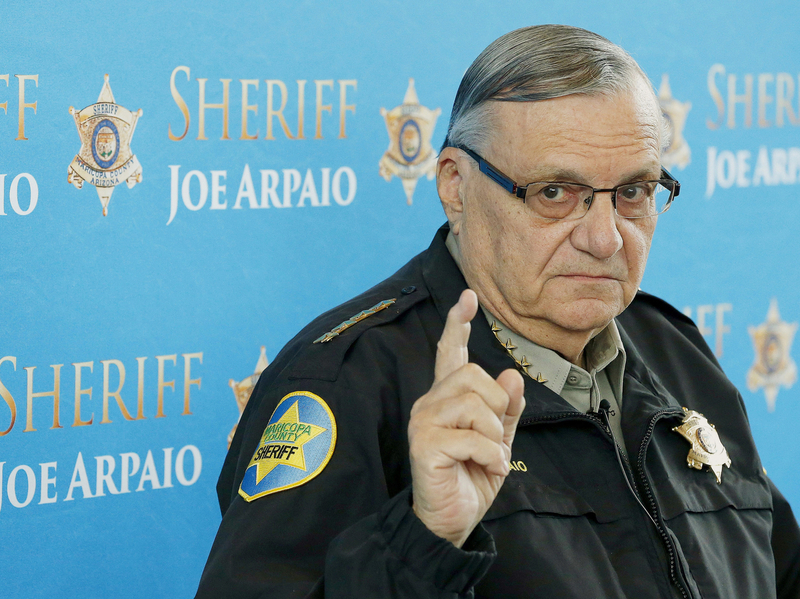 In Racial Profiling Lawsuit, Ariz. Judge Rules Sheriff Joe Arpaio In Contempt Of Court : The Two-Way The judge says Joe Arpaio has repeatedly and knowingly violated his orders to cease policing tactics against Latinos that he says amount to systemic racial profiling. Maricopa County Sheriff Joe Arpaio speaks at a news conference at the Sheriff's headquarters in Phoenix in 2013. An Arizona judge has ruled that Joe Arpaio, who calls himself "America's toughest sheriff," is in civil contempt of court. Judge G. Murray Snow says Arpaio has repeatedly and knowingly disobeyed his orders to cease policing tactics against Latinos that he says amount to systemic racial profiling. Friday's ruling brings the six-term Maricopa County sheriff "a step closer to a possible criminal contempt case that could expose him to fines and even jail time," member station KJZZ reports. "Sheriff Arpaio has been holding what he calls saturation patrols in Phoenix-area neighborhoods. They're aimed at rounding up people in the country without proper documents. Deputies have been stopping cars and detaining people while they ran immigration status checks through the federal government's database. So, the case was brought by a group of citizens and legal residents who said they'd been stopped just because they are Hispanic." The judge ruled three years ago that the tactics were illegal and must stop. He ordered "a sweeping overhaul of the agency, including making patrol officers wear body cameras and conducting more training to ensure officers aren't making unconstitutional traffic stops," KJZZ reports. Since then, Arpaio has publicly acknowledged violating the order – including "letting deputies conduct his signature immigration patrols 18 months after the judge barred them," KJZZ says. He argued in court that the violations were "not intentional." But in the 162-page ruling in the case against Arpaio and two other law enforcement officials, the court says they "intentionally failed" to implement the injunction. "In short, the Court finds that the Defendants have engaged in multiple acts of misconduct, dishonesty, and bad faith with respect to the Plaintiff class and the protection of its rights," the court documents read. The court has scheduled a hearing on May 31 to consider "what the remedies should be, and whether the sheriff should face possible criminal charges," KJZZ's Jude Joffe-Block tells our Newscast unit. Following the ruling, Cecillia Wang, director of the ACLU's Immigrants' Rights Project, said in a statement: "Strong remedies are needed to protect the community's rights, starting with internal investigations that root out and punish misconduct. Willing or not, the sheriff will be made to comply with the law." Joffe-Block reports that the sheriff's lawyers say that "despite disagreeing with some of the court's findings, they'd continue to work to comply with the court's orders."